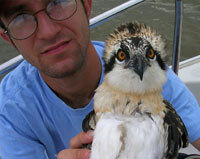 OspreyWatch is managed by The Center for Conservation Biology. The project was developed in an attempt to bring together a global community of observers to collect information for the common good. The project is unfunded and, as such, has been created and managed by unpaid staff and volunteers. Please help support the dedicated individuals who maintain the project. The Center for Conservation Biology is a 501(c)(3) organization. Donations are tax-deductible to the extent allowable by law.